We Need You! Help us build a playground at our family shelter! On June 17th, Next Move, in partnership with KaBOOM! and our corporate sponsor Dr. Pepper Snapple Group will be building a dream playground at the Family Shelter Campus in just one day, and we need your time, treasure, and talents to make it happen! 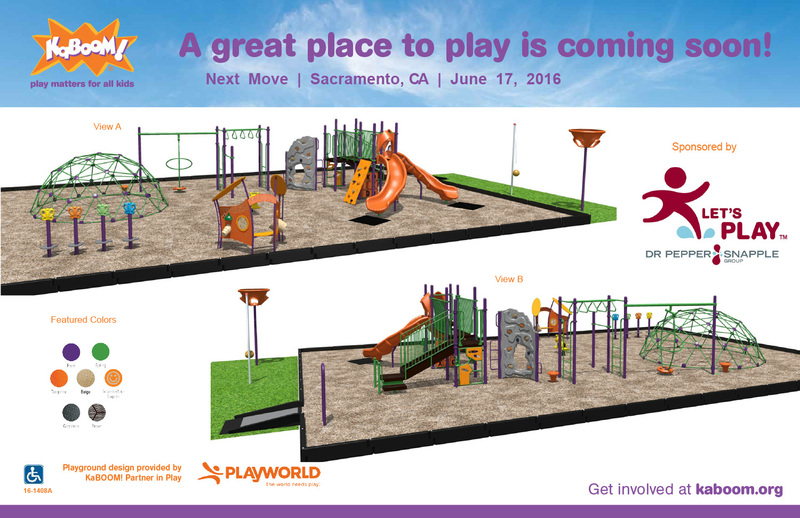 What: Let’s Play Sacramento, a one day project to build a new playground and assemble sports equipment to help ensure that children at Next Move and across Sacramento get the play they need. Learn more by visiting LetsPlay.com. Who: A total of approximately 225 volunteers from Dr Pepper Snapple Group, Good Sports, Next Move and the community. What’s Provided: Breakfast, lunch and plenty of Dr Pepper Snapple beverages will be provided. Gloves and other safety materials will be provided for the projects that need them. T-shirts will be provided. What to Wear: The project will happen rain or shine. Please come dressed for the weather in clothes you don’t mind getting dirty. Also closed-toe shoes are required; sneakers or work boots that you don’t mind getting dirty are advisable.